There is an owl that has lived in the grove of pines around our small country house for years and years. Once, driving up the hill late at night, it flew low over my car. That was on the same level as seeing the bear on the road. 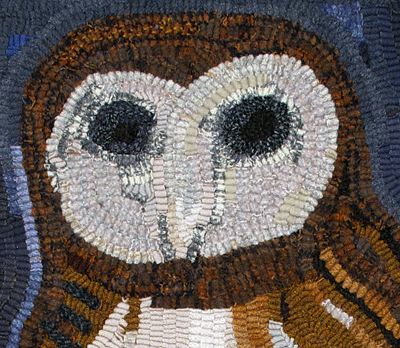 This rug is my attempt to appreciate the owl's mystery and presence. This piece can be displayed on the wall or used on the floor or table. Reproduction fabric bias tape binding on back. Muslin sleeve and dowel provided for wall display.